View your emails in full screen mode in Hotmail: this is sometimes the best way to read your emails, especially when an email contains a lot of text, uses a wide-content layout, or if you are using a small screen resolution (outside the obvious case of displaying Hotmail inside an un-maximized window, which is easily remedied by clicking on the Maximize button). 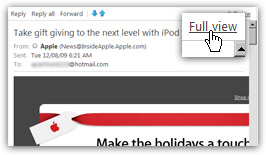 As explained in our email marketing tutorial, part of a successful email marketing campaign is to design emails whose content will fit in the maximum number of configuration without forcing overflow (scrollbars to appear because more content is displayed than the container's dimensions can allow). In this tutorial, we will show you two ways to display your Hotmail emails in full screen mode; the second trick even allows you to view your email without ads, even if you are not currently a Hotmail Plus subscriber! 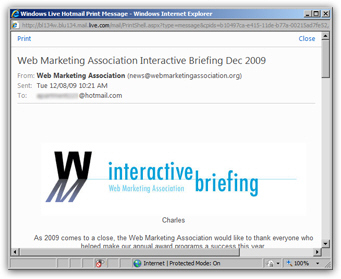 This tutorial assumes that you are checking your Hotmail emails from a web browser (e.g. Internet Explorer). If, instead, you are using an email program like Windows Live Mail to check your Hotmail account, simply double-click on an email to view it in its own window. While this may be hard to tell on the screenshot, this is actually the content of the entire screen: just your email and email folders. Note that we are using the Hotmail Plus service, which among other things, hides the ads - not only does removing the Hotmail ads helps avoid distraction from flashing banners for example, their absence also allocates more screen real estate for your emails themselves. For more information about removing Hotmail ads, please see our Hotmail Plus tutorial. Hotmail lets you convert your emails to a printer-friendly format: as it happens, the printer-friendly version of your emails does not contain anything but the email headers and body of the email. 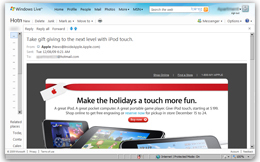 (More information on printing your Hotmail emails.) 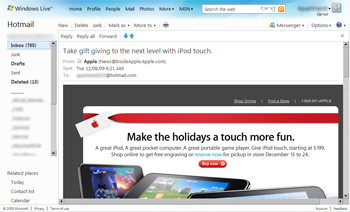 The side-effect of this functionality is that it hide the ads and banners the free Hotmail otherwise displays! This in itself makes reading your emails quite a bit easier; to go even further, hit the F11 key on your keyboard: this will display the current page in full screen mode. (The F11 keyboard shortcut works with Internet Explorer, Firefox, Opera, and Chrome. At the time of this writing, Apple's Safari browser does not support full screen mode on either Windows or Mac OS X.) Your email now in full screen mode, distraction-free reading doesn't get any better!